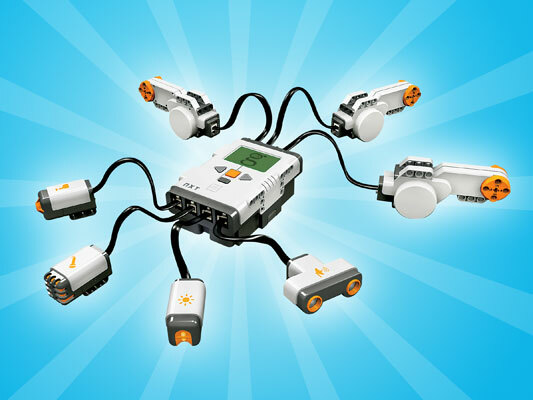 Take a look at the photo - it shows the brain and nervous system of the LEGO® Mindstorms NXT robot. The four pieces in front are what give the robot the ability to touch, hear, and see. These pieces are the sensors. The one on the left is touch. The robot can "feel" something by running into it with the orange button on the end of the Touch Sensor. During a collision (hopefully a very mild one) the button is pushed in. The robot now "knows" that something is there and will follow the next step in its programming in reaction to that collision. Move to the right one sensor. This one allows our robot to "hear". The Sound Sensor is a microphone that transmits signals to the brain of the machine. The robot can use the sensor to tell the difference between silence, people talking at a distance, talking up close, or shouting. Finally, the LEGO® Mindstorms NXT robot can "see" during the day or a pitch black night. When there is light, the robot uses the Light Sensor to tell the difference between lit areas, darkness, and the different colors of the visible spectrum. When there is no light, the robot can "see" in the dark just like a bat by using its Ultrasonic Sensor. The robot can tell if something (or someone) is right next to it, or up to eight feet away. There are more sensors available that what we show in this picture. Our robots can measure temperature with digital temperature sensors. They can detect radiated heat, such as a candle flame, with infra-red sensors. They can "talk" with bluetooth (that's the same technology that makes a wireless earpiece work with cellphone). They can deliver a cup of water over an uneven surface without spilling, using accelerometer/tilt sensors. They can park a LEGO car into a pre-assigned parking spot using RFID (Radio Frequency IDentification) sensors and tags. They can pretty much do anything with the proper sensors and programming. Enroll your daughter or son today. They'll learn to experience the world around them in a whole new way.